Chandigarh: Haryana Chief Minister Manohar Lal Khattar has said that Ayurveda can be called the fifth Veda as this system of medicine completely cures diseases and the state government is working hard to promote AYUSH as well as allopathy, Unani and natural systems of medicine. The Chief Minister was speaking after laying the foundation stone of Lala Khem Chand Charti Lal Goel Government Ayurvedic Dispensary to be established in the ancestral shop of Union Minister of State, Ministry of Parliamentary Affairs and Statistics and Programme Implementation Vijay Goel, in Jharoth village of Sonipat district, today. The Ayurvedic dispensary is a big gift to the people of the village and the nearby areas. Mr Goel has dedicated his ancestral mansion and shop to the people of the area. Mr Khattar said in order to promote Ayurveda in the state, ayurvedic AIIMS would be set up over 20 acres of land in Panchkula. Besides, Shri Krishna Ayurvedic College, Kurukshetra, has been upgraded to the level of university, and a Government Unani Medical College and Hospital has been established in Nuh. The building of Ayurvedic College in Patikra village is ready and it would start functioning next year. Apart from this, a training centre is being started by the Central Council of Yoga and Naturopathy in Jhajjar. A 120-bedded hospital and National Research Institute of Unani would also be set up in Faridabad, he added. The Chief Minister said the state government planned to give AYUSH a big push in the state. At present, three Ayurvedic hospitals, 19 Homeopathic and 458 Ayurvedic dispensaries are already functioning across the state. Appreciating the efforts of Prime Minister Narendra Modi, in promoting Yoga at the international level and getting declared June 21 as International Yoga Day, the Chief Minister said this had enhanced the pride of India in the world. Fulfilling the demands of both panchayats of villages Anandpur and Jharoth, he announced to give Rs 2 crore and assured the people that there would be no dearth of funds for the development of Sonipat. Terming Kundli-Manesar-Palwal Expressway as a boon for the area, he said industrial areas would be developed on both sides of the expressway which would generate employment opportunities for local youth. Speaking on the occasion, Union Minister of State Vijay Goel said Haryana had been making rapid strides under the leadership of Chief Minister Manohar Lal Khattar. 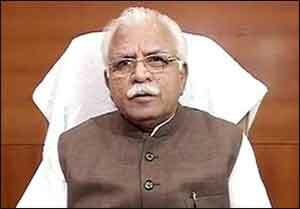 Mr Narendra Modi at the Centre and Mr Khattar in Haryana have been working 24 hours for the welfare of people. उसी को नया आधुनिक विज्ञान कहा जात था। अगर आयुर्वेद शास्त्र द्वारा anaesthesia का शोध लग जाता तो सारे दुनियामे आयुर्वेद जाणा माना हो जाता था….दूरभाग्यवष भारतीय आयुर्वेद द्वारा anaesthesia का शोध नही लगा जो की अलोपॅथिक सिस्टिम द्वारा anaestesia का खोज हुआ और इसी ansesthesia की खोज के कारण alopathic सिस्टिम सारी दुनियामे फैल गया…..
we will only know about these preachings and their values only when these authorities like CM , Ramdev, or other followers of Ayurvedic get ill and then they don\’t get treatment from or get treated by allopathy doctors . They should get treated by Ayurvedic people only till what ever the result. Sushma sawraj – she has close relations in Ayurvedic system but got Renal transplant done in AIIMS . This all is hierocracy .They preach Ayurvedic system to others but for in person problems they go to Allopaths . I totally agree with u ,madam sushma swaraj a great proponent of vedha medicine finally has under gone renal transplant . K R Narayanan was taking Kerala Ayurvedhic medicine before his system failed . Aysh is nothing but bunkam these pple are all bunkam fellows. They are all translating the modren medical knowledge and call it as ayush. Shame less bunkam fellows. SOUND BODY SOUND MIND. FOOD IS MEDICINE, MEDICINE IS FOOD. ONE CAN GET HEALTH BODY BY NUTRITIOUS DIET, REGULAR, SYSTEMATIC EXERCISES. THIS WAY WE CAN GET HEALTHY POPULATION. TO GET HEALTHY FOOD, WE SHOULD OVER COME POVERTY, OVER COME FILTH, POLLUTION, CONTAMINATION OF WATER, IMPROVE THE PERSONNEL HYGIENE AND PUBLIC SANITATION. INCREASE HUMAN HAPPINESS INDEX, DECREASE UN WANTED PREGNANCIES AND CHILD BIRTH. THEN WITH OR WITHOUT VEDA GOOD THINGS CAN HAPPEN. I SUGGEST THE C M HARYANA TO BAN ALL FORMS TOBACCO – HUKKA, CHILUM, GUTKA, BEDI, CIGARETTE, AND ALCOHOL – \”DESI DARU, ENGLISH WHISKEY, FRENCH WINE, GANJA, OPIUM…….. NASHA MUKTH HARYANA. Take Help from the sport men and women and Yoga Guru Ram dev. Follow Beti Bahcav, Beti Padav.